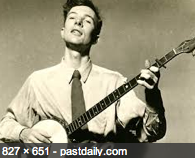 First Things has reprinted what your editor wrote a while back on Pete Seeger, who died Monday at the age of 94. Note the preceding photo. 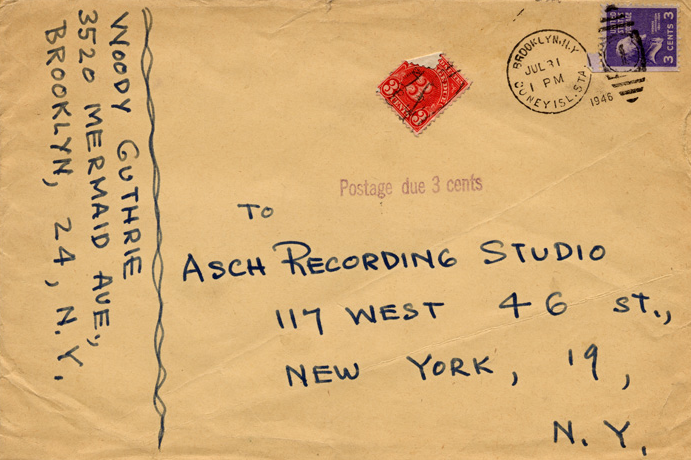 That envelope was sent to Moe Asch’s recording studio in Manhattan by Woody Guthrie. Moses “Moe” Asch (the original Mel Novikoff from Inside Llewyn Davis, see December posts) began putting Guthrie’s singing and playing on acetate master discs in 1944. The producer was “impressed with the man’s ability to make the radical past come alive,” according to Joe Klein in Woody Guthrie: A Life (1980). The Guthrie album called Struggle, featuring “some of his heavier material,” was an Asch release from 1946. Asch assigned Guthrie a project that was to have been the pièce de résistance: a set of original songs about Sacco and Vanzetti, who had been celebrated as martyrs by the Communist Party for decades. The songs didn’t turn out well. 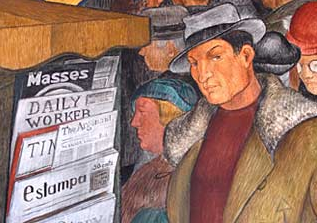 Guthrie’s work “was becoming rather ponderous and self-righteous,” writes Klein.